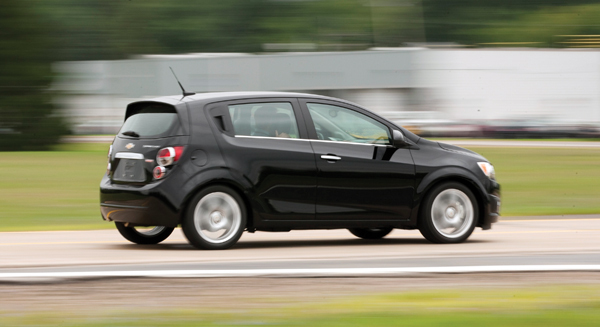 Filling the void created by the welcomed departure of the Aveo, the all-new Sonic puts Chevrolet at or near the top of goodness in the highly competitive subcompact war. The Sonic is offered in two formats, the sedan or 4-door hatch with designated trim levels LS, LT and the loaded LTZ. As with most other carmakers, the mid and upper trims simply add more packaged features to the base LS. 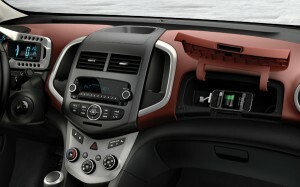 Chevy says the interior is “inspired” by motorcycles. We think it has a motorcycle-like instrument cluster, but not sure if we can categorize the entire interior under the “motorcycle’ heading. The rest of the dash comes in your choice of two-toned colors, dark titanium or brick. We had the latter, and it looked like a million dollars. Way to go Chevy! Two power plants are available, the 138-HP, 1.8-liter 4-cylinder that gets 26 mpg-city and 38-highway or a 1.4-liter turbo that has the same HP but slightly more torque. Pricing starts at $14,765 for the hatch and $13,865 for the sedan. How can you say no to that? Is it a Coupe or Sedan? 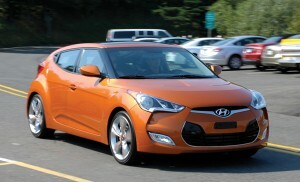 Hyundai calls it a 3-door coupe, but we’ll call it Veloster. This is an all new vehicle for Hyundai with one door on the driver’s side and two on the passenger side. Weird? You bet. Does it work? Yes, it does. Weird? You bet. Does it work? Yes, it does. Hyundai’s take on the full size, passenger-side rear door is that it allows much easier access to the back seat without having to open the front door. The correlation is drawn with the likes of the now defunct Mazda RX-8, with its half-sized, rear-hinged back doors. The Veloster is another car whose design, Hyundai says, “takes inspiration from a high-performance sport bike.” We don’t understand the fascination of car manufacturers taking away anything from motorcycles, unless it’s to capitalize on their current popularity among the buying demographic. The interior is competitive in the segment, and we’ll leave it at that. Powering the Veloster is a 1.6-liter I-4 engine that buzzes out 138-HP through a 6-speed manual or automatic transmission. Our tester is rated at 29 MPG-city and 38-highway. Look for a 200-HP turbo late this summer. If you’re in the market for very hip little sub-compact, the Veloster starts at $17,300.